Add 10 inches to your vertical jump, 100% Guaranteed. 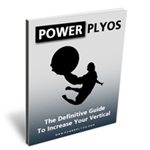 Power Plyos is the definitive vertical jump training system to increase your vertical jump. The secret behind increasing your vertical jump and adding inches is power! The Power Plyos Vertical Jump Training System is designed to increase your vertical jump and get the power you need to jump higher than ever before! Power Plyos is guaranteed to deliver results, if you aren't jumping higher than ever within eight full weeks you can request a 100% guaranteed, no questions asked refund. You have nothing to lose, and vertical inches to gain! What Exactly Is The Power Plyos Vertical Jump Training System? The Power Plyos Vertical Jump Training system is an all-inclusive vertical jump training system designed to add inches to your vertical jump with a complete, easy to follow training guide and step by step workout videos. Complete training guide containing a nutrition guide, illustrated workout exercises and stretches, workout schedules for beginners to advanced athlete and much more. Step by step instructional exercise videos that teach you how to exactly perform every stretch and exercise for maximum results. The complete Power Plyos Vertical Jump Training System is available to download immediately after secure payment. In 1999 I developed the most powerful and effective vertical jump training program available by combining power techniques with plyometrics for my clients to train with. I called it Power Plyos - it has stacked 8-14 inches to my clients vertical jumps, increased their first step quickness, agility and increased their maximum speed while reducing injuries. In 2002 I released the program to the general public, so now you can see what it can do for yourself. Power Plyos uses the scientific phenomena of plyometrics to train your central nervous system to harness the stretch-shortening cycle and access the stored elastic energy in your muscles. This energy contributes to a huge percentage of your final vertical jump height. Only Power Plyos can teach you how to unlock this powerful, forgotten energy and add inches and inches of raw vertical jump height. And this means, more more power and of course a dramatic increase in your vertical jump! Don't Waste Your Time And Money On Expensive Equipment Or Weird Training Programs That Just Don't Work! You've probably tried many products on the market trying to develop a respectable vertical jump, haven't you? Well I'll let you in on a little secret: In my many years as a professional vertical jump trainer I've tested bulky shoes, ankle weights, repetitive workout regimes, etc - lets just say I tested them all! You and I both know that they waste your time, money and they don't deliver any substantial results. Worst of all they can lead to injuries that put you on the side lines for months or even years at a time. Power = Force/Time. Now I don't want to get all scientific, but If you really want to have an amazing vertical jump you need power. And the only way to get more power is to generate more force in less time. "Power Plyos has changed the way I approach my basketball games. I have played against the top guards in New York as well as America. And after using Power Plyos I was able to have more confidence as a better athlete on the basketball court. I now attend the University of Massachusetts after being one of the top guards in Brooklyn for the past 2 years. Hopefully as a sophomore I will be a walk on for the program. Remember hard work with addition of Power Plyos will help you realize your basketball goals." "My two guards.....now reach to the hoops. Thanks to Power Plyos, my two guards that are 5'8" and 5'10" respectively can now reach to the hoops like big guys do. The team would like to thank you for helping them achieve their greatest dreams individually and they would like to request that you place their testimony on your website so people around the world can believe in Power Plyos... Best regards"
"I Gained Over 10 Inches. Power Plyos is the most effective plyometric system that I have tried, and I have tried my fair share, from programs involving special shoes to programs that mimic Power Plyos with less effectiveness. I gained over 10 Inches on my vertical jump using the Power Plyos system the amazing thing is that I achieved this during a stage in my athletic development that saw me add 15 pounds to my frame so even though I was heavier Power Plyos helped me develop enough thrust to effectively move the weight higher into the air then other systems did at a lower weight. If you want to evolve from a average athlete into a great athlete give Power Plyos a try." Not Using Power Plyometrics Means You Are Wasting 50% Of Your Vertical Jumping Energy! What Power Plyos focuses on, and what other vertical jump programs overlook, is that there are 2 phases to the vertical leap, not just 1 single phase. That's right. Before you jump there is a phase where you actually stretch the muscle to build up elastic energy. This is known as the loading phase and it can account for up to 50% of your final vertical leap height! Most athletes don't know how to store elastic energy in their muscles and they don't have the ability to use it. The athletes that do learn to harness their potential elastic energy have been tested to have extremely high vertical jumps and a huge edge over the compeition. Now you can use Power Plyos to teach yourself the exclusive art of unleashing stored elastic energy to stack inches to your vertical jump! Simply get your hand out and place you palm face down on a flat surface, such as a table. Now tap the table hard as you can with your middle finger while keeping your palm flat against the desk. Did you tap the desk very hard? Now do the same as before, but this time take your other hand and lift your middle finger backwards to build up tension, then release it to tap the table with it. How much harder did you tap the desk? I'm guessing this time you just about hurt your finger because you hit the desk much harder. The reason why you hit the desk so much harder is because you built up elastic energy when you bent your finger back, you then released this energy and it added the extra power. Now just imagine if you could harness that potential elastic energy in your legs and applied it to the ground. How much higher do you think you could jump? I can tell you that it will greatly increase the height of your vertical jump - guaranteed. The secret of effective vertical jump training is definitely quality, not quantity. Power Plyos is performed just 2 times a week, compared with other popular programs which require you to workout up to 5 times per week. That's 60% less work and time with the Power Plyos program, and we guarantee far better results! The difference with Power Plyos is you're using optimal plyometrics to train your central nervous system, not wasting time with outdated non-plyometric methods that only train your muscles. Power Plyos simply is the most functional vertical jumping program out there. Stack on 8-14 inches to your vertical jump and realize your dream of flight. Unleash lightning fast, first step quickness and super quick agility that will leave you feet ahead of your opponent. Slash .25 seconds off your 40-yard dash and pass team tryouts with ease. Get amazing flexibility that will leave you injury free without excessive stretching. Score more points, grab more rebounds, block more shots, drive with ease and dominate the game with your new found athletic ability. Workout 50% less than any other program and still get better and quicker gains than any other program. Learn how to shock the central nervous system to give instant gains in your vertical jump. Discover 6 powerful yet simple to learn exercises which are designed to unleash lots of power in a short time. Discover how to measure your vertical jump correctly and to tailor your workouts to your exact training level. Discover how to seamlessly integrate Power Plyos into your existing workout program. Not only does Power Plyos come with a 100% money back guarantee, but if you order the Power Plyos Vertical Jump Training System by April 24th the following bonuses below are included ABSOLUTELY FREE. These free bonus training reports are yours to keep forever. Inside this report you'll discover four things you can easily do to your shoes that have been shown in scientific studies to instantly increase your vertical jump. Including: The effect ankle braces and supports have on your vertical jump and two quick things you can do to your existing shoes to add instant inches. You wont find this anywhere else. This is the only place you can find this drill. That's because no one else has discovered it yet. This drill is designed to teach you how to harness your horizontal momentum (running speed) and use it to increase your vertical momentum (vertical jump). Its very very effective, and even simpler to do. These "dirty" secrets are designed to be used immediately before you need a vertical boost, such as before a vertical jump test or a basketball game. These dirty secrets are based on scientific research that shows specific, quick exercises can have instant positive effects on your vertical jump. Get All The Bonus Reports NOW - Absolutely FREE! I am so certain that you are going to start jumping higher than ever before from using my program that if for any reason you aren't 100% satisfied with Power Plyos you can return it for an immediate refund of your money. If you aren't jumping higher and exploding faster than ever within 8 full weeks then you will receive a 100% no questions asked refund. Thousands of people have already used Power Plyos to explode their vertical jump and to better their game. If you don't grab your copy of Power Plyos today the only person missing out is you. How much more time do you want to waste doing outdated exercises resulting in a vertical jump that isn't even half as good as the competition? If you're investing your time to train, don't you deserve to jump as high as possible? YES! Count me in, Matt! I'm ready to jump higher and want to increase my vertical jump today! I'm prepared to try the Power Plyos Vertical Jump Training System. ACT NOW, SPECIAL OFFER PRICING! After ordering you will have instant access to download the Power Plyos Training System, bonus workout videos and bonus training reports in convenient electronic format - even if it's 2:00 AM. After clicking the download now button you will be transferred to Clickbanks secure website to process your payment. The number one reason why I see athletes fail to achieve the vertical jump they want and the athletic future they desire, is their inability to make a decision. The inability to take the next step, or in some cases the first! Sure, if you don't take the next step you can't fail, but you can never have any success either. History shows that you might not ever have the chance to take that next step again and then regret it for the rest of your life. Make the next step right now! Give your athletic future what it deserves and get Power Plyos today. There is absolutely nothing to risk because you're covered by my 60-day iron clad, keep-all-the-bonuses risk free, money back guarantee. That's right - you keep the bonuses as a gift from Power Plyos for just trying our program! Our results speak for themselves, the average increases in vertical jumping of our users is an amazing 8-14 inches - you won't regret it. Good luck! P.S. Act Now! How can you lose? In fact, you've got nothing to lose except an extra 8-14 inches of vertical leap height if you don't get the Power Plyos System. Remember: Power Plyos is the only program on the market that uses optimal plyometrics to teach yourself to use your stored potential elastic energy. I've got you covered with my 100% risk free guarantee, so if it doesn't work out for you, you get your purchase price back, plus you keep the bonuses. P.P.S. Still not convinced? Have a look at what a few more of our users had to say about Power Plyos below. "Dear Power Plyos, I'm just writting to thank you for your awesome program! It took a few weeks to see the gains but I stuck it out for 24 weeks and now have gained a very decent 11 inches! I have also noticed a noticeable increase in speed.... I would also like to thank your constant online support during the program....Thanks." "When I first bought your ebook I thought how can an ebook change my vertical leap. I soon found out after a few weeks when I noticed I could touch the rim for the first time. I'm only 5ft 8inches so this was big news for me. I soon thought after this if I keep going I reckon I could lay down a dunk (which I can now do on most occasions after the program). Thanks Power Plyos this really was a dream of mine." "Power Plyos is working great for me. I have gained about 5" over the first 8 weeks and am very happy with my results..."
"Hi I bought your book about half a year ago. I only used to touch the rim before and being 6,2 ... so i decided to buy the ebook and out of it I gained a wicked 12 inches... I enjoyed it so much and suggested it to my friends,,... Thank you"
"Hey guys if your needing motivation for this program here's some that gave me motivation... my friend has been doing this and he is on week 16 and has gained 13 inches and his vertical was 23 inches and now in just 16 weeks it is 36 inches"
"Thank You! you guys lived up to your promise, I went from touching the rim to two hand dunking, simple." Hi, I have been on your program now for over a year and I have been playing basketball for 2 years now. I am 5'11 and can slam dunk on a 10 foot goal... I recommend this to any one who wishes to slam." "I only brought this because it had a money back offer so I thought what the heck,. what's there to lose. I don't have a lot of motivation and have quit many well known vert programs. The only reason I finished Power Plyos was it was so simple. I thank God for finishing now as I've gained over 7 inches. It also has given me motivation to train harder for my sport basketball. Power Plyos thank you." As with any fitness activity and especially plyometrics, there is a possibility of injury. Before beginnining Power Plyos, we suggest consulting or seeing your family physician. He will advise which exercises you will safely be allowed to do with respect to your present physical condition. We are not responsible for any injury as a result of using Power Plyos and proceeding with the program means you accept all responsibility for any injury as a result of Power Plyos. Use of this program constitutes a covenant agreement to not bring any lawsuit or action for injury caused by performing information in this ebook. The web site and the Power Plyos guide and its contents are protected under U.S. and international copyright & trademark laws. Power Plyos and the PowerPlyos logo are copyright of PowerPlyos.com.